Throughout history many cultures have wrapped babies from the neck downwards entirely in a cloth or light blanket. This method of wrapping can help babies to feel settled, and being contained or held gently within a blanket can encourage a baby to sleep less fretfully. Babies that are not wrapped can often be woken by involuntary jerks which are both common and normal in the first few weeks of life. Towards the end of pregnancy most babies wrap themselves in a ball, with their arms crossed in front of their chest and their knees and legs tucked up towards their tummy. This is referred to as the foetal position. From the baby’s point of view, being swaddled while sleeping during the first few weeks outside the womb will help a baby to feel more settled, less fretful and encourage a longer sleeping pattern with less likelihood of the startle jerks or Moro reflex disturbing him. All babies are born with the Moro reflex which presents itself with uncontrolled startle jerks of the arms and sometimes the legs. It is thought that swaddling creates a restrictive space for a newborn similar to that of the womb. The swaddling cloth or blanket, like that which was used to wrap Jesus as a baby, is now considered far too restrictive. Although many parents and carers of small babies still find it is the most comforting way to settle a baby to sleep, some doctors have suggested that tightly swaddling a baby could cause hip damage. While swaddling may be influenced by parent’s or carer’s personal belief and cultural practices, if you intend to swaddle your baby it is wise to read the arguments for and against, so you can make an informed decision. 90% of all infants in North America are swaddled, as are the babies of the Inuit people. The Inuit have swaddled their babies for centuries to help them keep warm before hoisting them onto their backs. If you do intend swaddling make sure the swaddle cloth or wrap is made of light-weight cotton material (large muslins are ideal) and make sure that it is only the hands and upper torso that are wrapped firmly. The swaddle wrap should be loose around the hips and feet, allowing plenty of hip movement. The hands can be placed in the foetal position on the chest. 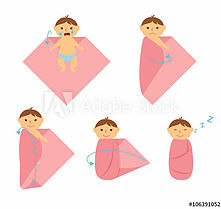 The wrap is folded in a triangle with one corner folded across the chest and the other corner folder over the first to the other side, finally folding neatly round the baby’s back at approximately waist height. It is essential to ensure your baby does not overheat while still being warm and cosy when settled to sleep.